What do you have to do to be “accommodated” at work? What is “undue hardship”? What medical documentation is required? How is it handled? When can the Employer or Insurer ask for an Independent Medical Examination? How long does STD last and how do I return to work? What are the tests to be met? How do you meet the tests? How do off-sets work and what is the impact on the LTD benefit? What happens if you are denied LTD? Should you appeal or sue? What is the difference between “own” and “any” occupation? What kind of job security do you have? Can you be terminated if unable to work? Do you have the right kind of coverage? Please RSVP to Elizabeth Polnicky, ep43@queensu.ca by April 10th if you plan to attend the workshop. 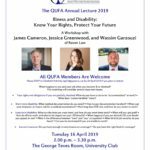 The Workshop will be followed by a Quaff with QUFA Reception at 3:30-4:30. 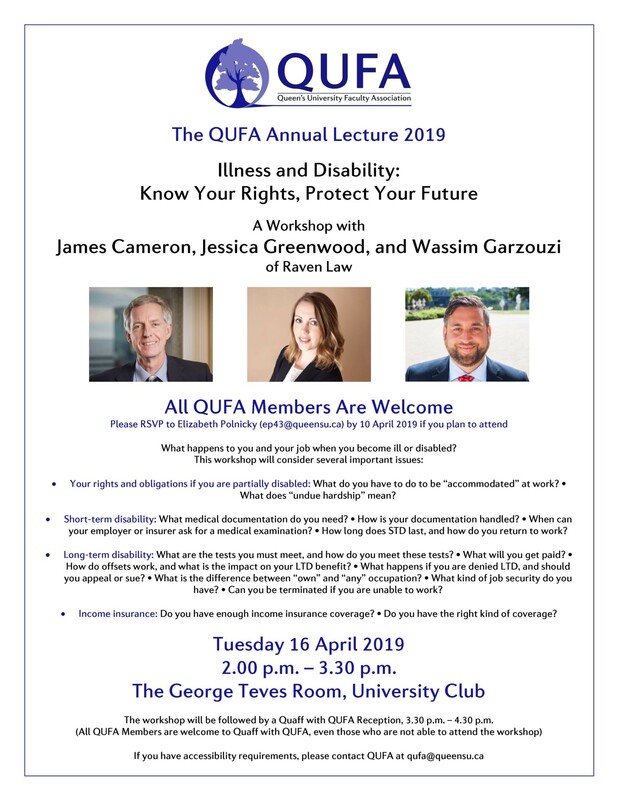 All QUFA members welcome even if you can’t attend the workshop.